Poets' Corner K-3 is a Powerful Practice that supports the development of fluent reading. 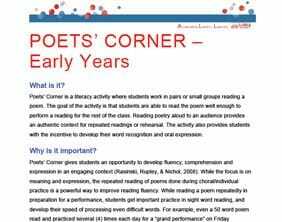 Based on ideas related to repeated readings research, Poets' Corner can promote reading engagement and enjoyment, while providing opportunities for students to develop phrasing, expression and automatic word recognition. Oral practice and performance builds student confidence. Love it and use it with students of all ages.